The Ways of the Wayments: Nakie Baby!!!!! Grayson LOVES it when I leave him without his clothes for a while! And he's getting so cute and chubby! I had to show some pictures! :) Look at those arm rolls!! Haha! Ollie of course has to stay close -- he's licking Gray's foot in this picture -- he thinks he's helping! Grayson is also smiling now! It's so cute! 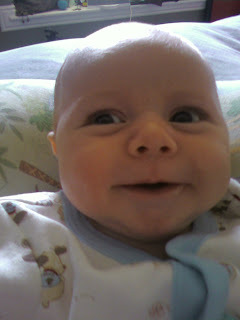 This is the end of a smile -- I couldn't get a good picture of one of his full-faced huge baby grins! You can almost see his cute dimple on his right cheek. Oh it just melts my heart! I love it! oh - I just need to smoosh him again ! I love those fat little legs ! OH !!! don't ya just love him !! 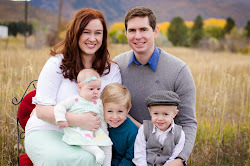 Sam and Steve, It's jenn boman (barker) tyson showed me your blog and I think your little boy is adorable and I love the name.